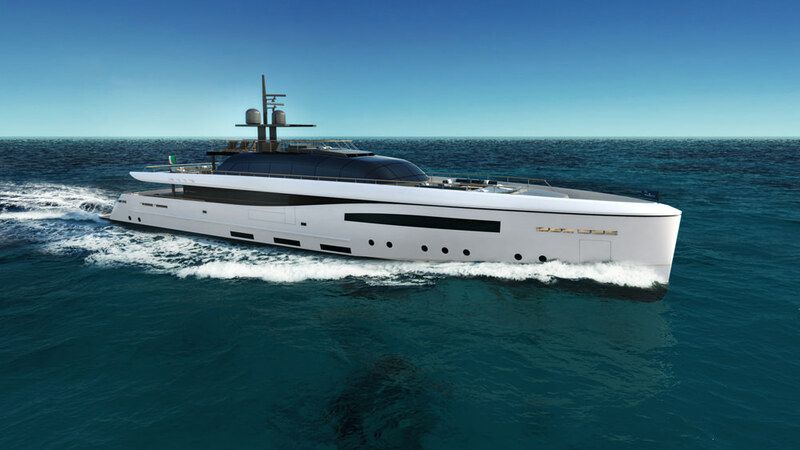 The elegant simplicity of the 50m semi-displacement model by the Santa Maria Magnolfi design team completes the flying seagull’s V-Line series. With the single line of its upper deck extending from the plumb bow to the stern and a superstructure encased in tinted glass, the muscular yet pure profile of the new design resembles nothing less than an aerodynamic arrow. The latest addition to the V-Line series, the 50m by Santa Maria Magnolfi reinterprets in a modern key the sporty character of historic Baglietto yachts, such as the famed 26m Chato, an iconic project from the mid-1980s. Arguably the key feature of the design is the upper deck, which is enormous for a yacht in her size category. 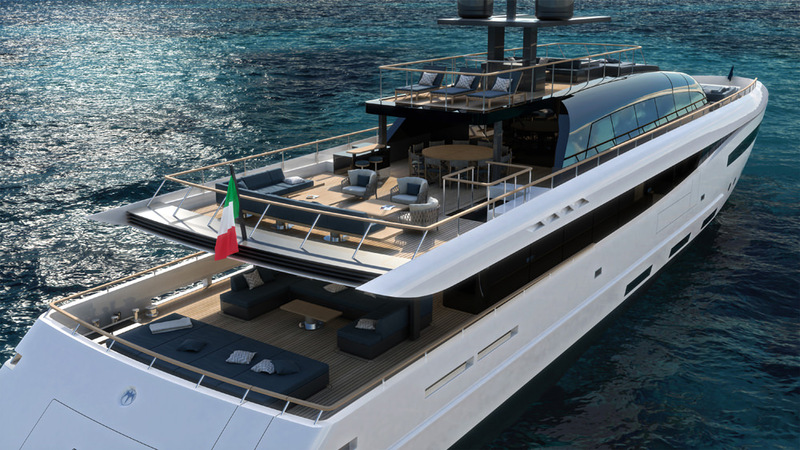 Despite being under 500GT, the layout makes maximum use of available space to offer guests the full length of the walk-around deck with generous social areas both forward and aft. At the same time, the low-profile glass superstructure offers panoramic views and ensures that the interior is filled with natural light. Rare on a yacht of her size is also the opportunity to choose between a large gym or VIP suite on the main deck aft of the master stateroom suite, in addition to the four guest cabins on the lower deck. The owner’s suite itself offers 60 sq/m of space and includes a walk-in wardrobe with large windows (so clothing combinations can be matched in natural light), a full-beam forward bathroom and a private study with direct access to the exterior deck. The sun deck is a balcony-on-the-sea furnished with loungers, sunbeds and a Jacuzzi. 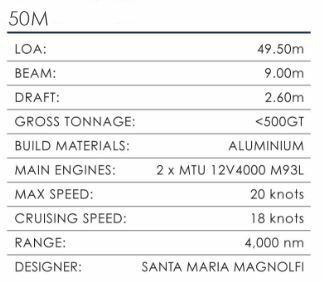 Tender storage has also been carefully thought through, with an aft garage that can house a 6m tender and a foredeck locker that is large enough for a 3.5m RIB. 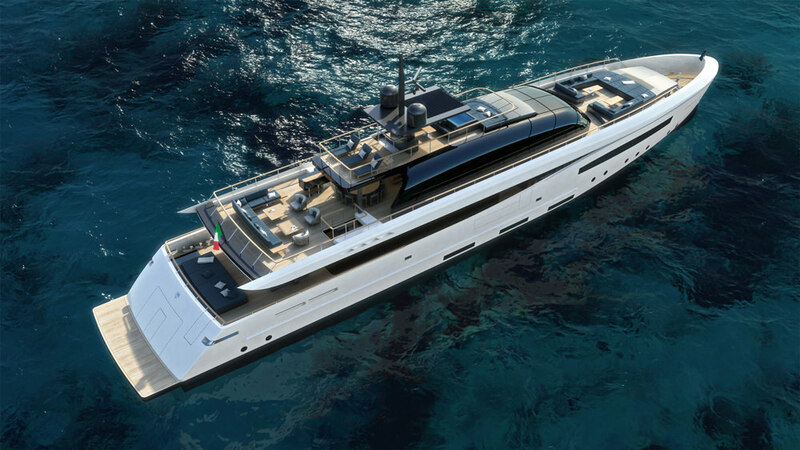 The 50m by Santa Maria Magnolfi joins other models in the V-Line series that includes a 41m and a 55m version by the same studio, as well as designs by Francesco Paszkowksi (41m and 44m) and Hot Lab (38m, 41m, 44m and 50m).